Shrubs benefit the landscape by adding height and texture along with blooms or fruit at various times throughout the year. They provide wind protection and increase privacy as well. Some shrubs take many years to reach the point of providing such benefits, but choosing fast-growing species eliminates this problem while quickly creating a mature-looking landscape. Many options exist for fast-growing shrubs in USDA growing zone 9, easily divided by their light requirements. Many fast-growing shrubs do well in a shady location in zone 9. Examples include Foster holly, a glossy-leafed evergreen that produces red berries in the winter, as well as Nellie R. Stevens Holly, another berry-producing evergreen shrub. An example of a deciduous shrub in this category is the European Cranberry Viburnum, a multi-stemmed shrub with colorful fall foliage and fragrant white flowers in summer. Other deciduous options include serviceberry and allspice shrubs. Areas with only partial shade provide even more shrub choices. Examples include oakleaf hydrangea and boxwood. Oakleaf hydrangea offers burgundy-colored leaves in the fall and white-flowered spikes earlier in the growing season. It reaches at least 6 feet in height, but comes in dwarf cultivars that remain in the 4-foot range. 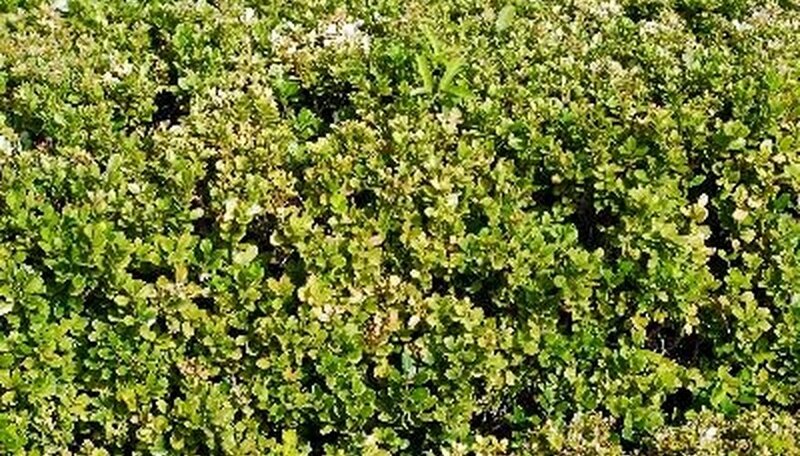 Small-leaved boxwood grows from zones 6 through 9, producing tight, closely spaced evergreen foliage that creates an ideal privacy hedge approximately 3 to 5 feet tall. Border forsythia remains a popular choice as a shrub in warmer climates such as zone 9. It offers a fast-growing option in areas with full sun, but requires considerable care, including frequent pruning to maintain proper shape and healthy growth. Dwarf fothergilla also performs well in full sun, though it requires moist, well-draining soil, meaning watering remains a priority throughout the growing season. White fringetree is another excellent choice that thrives in sunny locations in zones 4 through 9; it develops bird-attracting fall fruit and fragrant white flowers mid-summer. Other factors that affect zone 9 shrubs include micro-climates created by variations in elevation or material such as stone walls and reflective white gravel surrounding the planting area. These factors may increase the already significant heat during the summer, further stressing shrubs. Especially cold-sensitive plants benefit from mulching, which protects roots and also retains moisture in the soil. Providing ample water and protecting shrubs from drying winds by placing them in protected areas at the side of the home ensures good growth and development. Keep in mind that shrubs planted near smaller landscape plants may absorb a vast amount of the soil nutrients, leaving other plants to struggle in poor soil. Protect against this phenomenon by fertilizing your plants regularly, according to the species. Alabama Cooperative Extension System; Hydrangeas; Kerry Smith, et al.